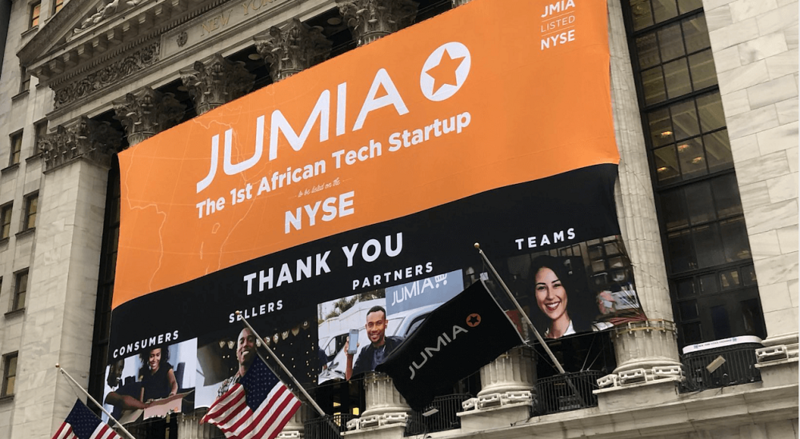 Almost a month after filing for an initial public offering (IPO) on New York Stock Exchange, the Lagos-headquartered ecommerce startup Jumia today has finally listed on New York Stock Exchange, with the shares opening at $14.5 and surging over 50% within the first hour of trading (H/T). At the time of writing, they’re trading at close to $23, up by 58%, valuing the company at over $1.5 billion. It will be interesting to see how they fare in the coming days. Jumia had become the first African unicorn in 2016 when according to publicly available data, it raised over $300 million at a post-money valuation of $1.2 billion from existing investors including Rocket Internet, African telecom operator MTN, Glodman Sachs and others. The company has confirmed that it has raised $196 million through the IPO. Founded in 2012, Jumia that is present in 14 markets including Egypt, Morocco, Tunis, & Algeria, includes almost all the Rocket Internet’s businesses in Africa including an online marketplace, food delivery, hotel and flight bookings, and even real estate listings. These businesses until 2016 were operating as independent brands by Rocket Internet’s Africa Internet Group before they were consolidated under Jumia’s brand. According to Jumia’s SEC filing, Nigeria where the company is headquartered and Egypt are two of its biggest markets. The two countries, per filing, generate a larger portion of Jumia’s GMV than any other country where it currently operates. The company in its filing also disclosed its GMV last year was $935 million (€828.2 million), up from $572 million (€507 million) in 2017. The revenue also has been on the rise with $147 million (€130.6) in 2018 – almost 40% of increase from $106 million (€94.0) in 2017. But the losses have also been increasing. The company, per its filing, witnessed an operating loss of $191 million (€169.7 million) in 2018, up from $175 million (€154.7 million) in 2017. As of December 31, 2018, company’s accumulated losses since it was founded in 2012 were close to $1 billion (€862.0 million to be exact). Souq and Noon will be keeping an eye on how their loss-making competitor in Egypt performs on NYSE over the next few days. The relatively smaller ecommerce players all across Africa will also be watching closely as a decent performance in the public markets could be seen as validation of the entire ecommerce sector of the region.